I’m slowly but surely reviewing the workout DVD’s that I’ve done. You can check out previous reviews here. Today I thought I’d talk about Billy Blanks: Tae Bo Ripped Extreme . I have to admit that I liked this Tae Bo workout better than Tae Bo Flex. I think part of it was for the most part I was moving the entire time with this DVD, whereas with Tae Bo Flex you’d be holding a pose for 10 seconds at a time. The choreography was great in Ripped Extreme. I always feel like Tae Bo workouts are “more fun” than some other ones because I usually don’t kick or punch in my every day life. During these DVD’s it kind of feels like I’m back to being a kid or like I’m in an action movie. I like that this DVD is fairly recent (2011), so the workout clothes in it are still fairly current. Maybe it’s just me, but I find it “easier” to put in a DVD if it’s not as dorky feeling. I’m pretty sure if someone saw me working out they’d think I was a crazy woman, cause I’m not very coordinated. Seeing people that look put together on the TV somehow make me think I look better too. Ripped Extreme is just under an hour. The first half of the workout is your typical Tae Bo movements – kicks, punches, and jumps, while the second half uses weights. I typically choose to go with smaller weights cause I always (ALWAYS) start out too heavy. I’ve hopefully learned my lesson though, and now I try to go with smaller so I can complete the whole workout with good form. When I’m done this DVD I’m always sweating like crazy and exhausted. Sometimes it’s easy to slack off during DVD’s, but I find Billy Blanks motivating, and when I feel like I could take things a little easier, he says something to get me back on track. I think it’s a great total body workout with the weight section. 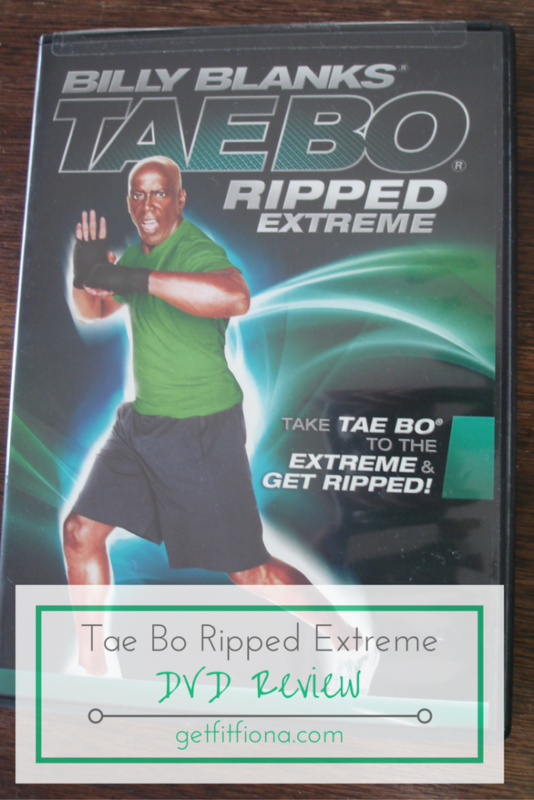 Do you have a favorite Tae Bo DVD? Have you tried kickboxing before? We used to do Tae Bo videos in jr high gym class lol I bet its still a great workout! I had access to them in my high school phys ed class too, though I don’t remember ever doing them.